Comments: Evergreen broadleaf native to Australia. Showy yellow flowers in winter, silver gray pinately divided small leaves and gray bark. 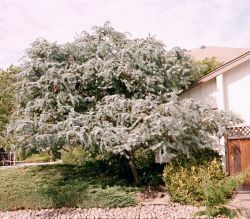 Tree form is generally round and low growing. Also known as Cootamundra Wattle.